I would like to welcome you to explore my world and get lost in the magic! My greatest desire is to show the world that fairies are real and do exist. I would also like to show people how beautiful, intelligent and loving seals are and help raise awareness of their plight here in Scotland. 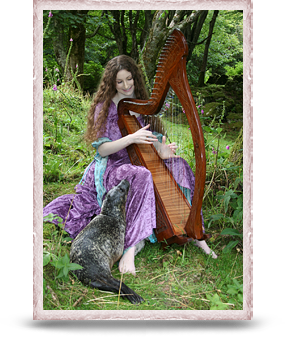 I want to share with people the magic I experience and some of my fairy knowledge and fairy secrets that I have learnt living in an enchanted Celtic rain forest by the sea on the on the Hebridean Isle of Islay. In our busy, modern lives we sometimes forget to stop and look, to slow down and appreciate the beauty in the natural world around us and maybe that is why many of us do not even notice the Fay. Through my art, music and books I hope to allow children and adults alike to feel the wonder of the fairy realm and bring them the delight of finding that fairies do exist! My next event will be the Samhain Avalon Faery Fayre and Ball this October.